Designed by Judi Boisson. 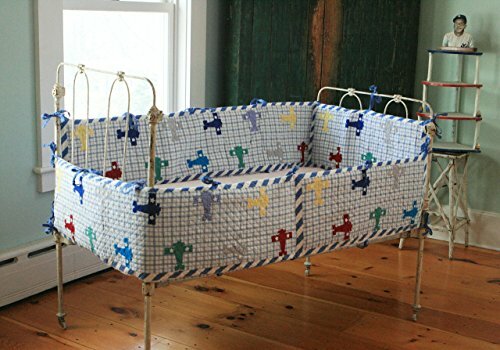 "Multi Plane" Crib Bumper in Blue Plaid. Tiny White Stars on the Wings of Bright Appliqued Airplanes. Diagonal Royal Blue and White Stripes Run Along the Border . Reversible with Colorful, Hand Appliqued Stars. Time to get the pilot started for his first big Flight. Cold Water Wash- Before Washing, Please remove insert.